Tetsuharu Kawakami, a giant of Japanese baseball famed for his hitting prowess with his red bat, died on Oct. 28. He was 93. During his professional playing days, Kawakami was called the "God of Hitting." After retiring as a player, he became the manager of the Yomiuri Giants and led the Kyojin to nine consecutive Japan Series championships. Kawakami was born in Kumamoto Prefecture. During his high school days, he was the team's ace pitcher and in 1937 his Kumamoto Technical High School was runner-up in what is now the summer national high school baseball tournament. He joined the Giants in 1938, where he switched positions and played first base. In 1939, Kawakami was the leading hitter in Japanese professional baseball with a .338 batting average. Before retiring in 1958, Kawakami was the leading hitter five times, the home run champ twice and RBI leader three times. He appeared in 1,979 games and had a career batting average of .313. He had a total of 181 home runs, 2,351 hits and 1,319 RBIs. He once said about his prowess at hitting, "The ball appears to come to a stop." 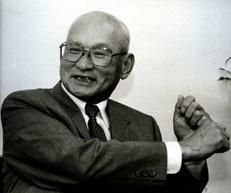 Kawakami became manager of the Giants in 1961. With such stars as Sadaharu Oh and Shigeo Nagashima, the team was unstoppable and began its streak of winning nine straight Japan Series titles from 1965. Between 1961 and 1974, the Giants won the Central League pennant 11 times and won all the Japan Series they played in. Kawakami was inducted into the Japanese Baseball Hall of Fame in 1965. His number 16 has been retired by the Giants. After retiring as manager, Kawakami became a commentator and also participated in baseball clinics for children around Japan.